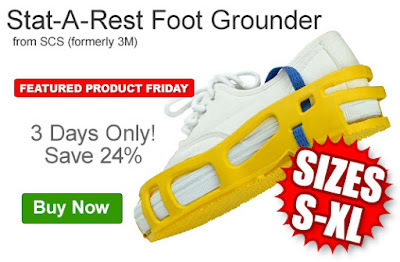 Save 24% off the MSRP on SCS (formerly 3M) Stat-A-Rest Yellow Foot Grounders (sizes small, medium, large & extra-large). Our FPF051316 Coupon Code is auto applied when you add an eligible foot grounder to your shopping cart. This Featured Product Friday (FPF) promo is valid from today, May 13, 2016 through Sunday, May 15, 2016 and the code is unlimited use. The American-made SCS Stat-A-Rest Foot Grounder converts normal footwear to ESD footwear. Meeting ANSI/ESD S20.20 < 100-volt peak voltage requirements, this foot grounder is made of non-marring conductive material that works with the operator’s sweat layer to create a reliable connection. For further questions about Featured Product Friday, please read our informational blog post, call us (800-966-6020), or send us an email. Please note: This promo is valid only at QSource.com and expires on May 15, 2016.